The millionaire Fredderick Trummel has been murdered, and you have been called to his home for the reading of his will. Upon entering his dining room, however, you are locked in and there’s no executor to be found. A note from Fredderick informs you that you’ve been tricked and implicated in federal crimes against the late millionaire! Figure out who the murderer is, and escape Fredderick’s home before he exacts justice against you from beyond the grave. Time’s Up delivered a larger room for their Millionaire Murder experience, but it was mostly empty when we walked in. It was, however, definitely too small for a group of 12 puzzlers, I would venture 8 would be the coziest you’d want to get in here, and that’s pushing it. A large centerpiece was competently decorated, if not mind blowing, but there were only a few other pieces that stood out, but they didn’t quite give off the decadent feel a millionaire’s dining room should. Prices written in sharpie on the backs of most items gave away the inexpensive nature of the room. Our Gamemaster was upbeat and friendly however, and seemed eager to please. Though this was a very low tech experience, there were a few fun surprises and original puzzles at the beginning of the experience. The initial few puzzles were well clued and worked smoothly, and the story set up was interesting. As we progressed through the puzzles, though, the adventure degraded as the flow and technical issues began to break down the immersion. Mid to late game puzzles weren’t very well clued, and many props we found didn’t fit the theme, as they did not seem like the property of a millionaire. One such piece had been busted a few times, and simply not replaced, which was odd since this supposedly belonged to someone for whom money was no object. There was also a red herring item that was oddly well hidden, which wasted a fair bit of our time. One lock was opened via the wrong key, due to the looseness of the lock and cheap nature of the item itself, and we were told to replace the item inside and lock it back, which irked us. Some later puzzles were not clued, and as a result, ended up in fruitless searches of an already sparse room. Overall, the experience started strong, but faltered quite a bit as time went on, ending with a whimper. The Millionaire Murder Escape was full of missed opportunities. While there were interesting ideas and puzzles, the execution was subpar as so much more could’ve been done with the space. The owner seemed receptive to feedback, and genuinely seemed to want to improve the experience, but as is, it’s a difficult recommendation to make. You can book your escape from The Millionaires Murder here! Sullivan King needs your help with a new case, this time it involves the disappearance of Olivia Jamison. The young woman accepted a mysterious invitation to attend a job interview for the position of her dreams, but never returned, and her fiancée Doug Masters is worried! The police have chalked it up to Olivia’s wanderlust, but Sullivan isn’t so sure it’s that simple. Follow the clues and retrace Olivia’s steps before she disappears for good! Sleuth Kings has a spiffy new box, and the case file inside is just as exciting! A enigmatic prop was included outside of the case file itself which intrigued us immediately, and the printed materials were top notch as usual, bolstering the mystery. We couldn’t wait to get cracking with another case! Along with the amazing presentation, the story was engaging and tense. While the stakes of Case 006: The Show Must Go On were appropriately, pardon the pun, dramatic, this case upped the level of danger greatly! We weren’t just saving a theatrical production this time, a life was possibly on the line! Puzzles were, as we’ve come to expect, more difficult than your average mystery subscription box, and demand a good amount of brainpower to work through, while still delivering a fair challenge for the most part. Last time, it felt as though Sullivan took forever to respond to our emails, but on this case, he seemed to get back to us more quickly. I’m not sure if the response times have actually been adjusted, but overall, there was less downtime, even though we emailed him more frequently during this case. Some old code cracking standbys have been used, but updated in such a way as to feel fresh and present a new challenge. This was an excellent surprise after having used some of these solving methods several times in other boxes and puzzle hunts. Puzzles layer upon each other deviously and grow appropriately more sinister as the story continues. The story’s pivotal moment was exciting and ended climactically, paying off the high stakes mystery satisfyingly. That wasn’t all she wrote, though! As always, one of our favorite things about Sleuth Kings is that the story doesn’t end when you reach the end of your initial box. A few days later, the ending and extra puzzle arrived in the mail, closing out this part of the story, and continuing the meta-narrative about Sullivan’s father. There was also a great set-up within Case 007 that leads into Case 008, and we cannot wait to find out what happens next! The puzzles, while we expected them to be difficult, were a bit more esoteric on this case. Hints provided through Sullivan’s notes and emails were helpful, but in some areas, we felt like they were almost required in spots without making Herculean logical leaps. This is not to say the puzzles weren’t enjoyable, but we felt there could have been a bit more direction and cluing, especially with the initial puzzle. The story started out slowly, and with the frustration of trying to get started with Clue 1, the immersion faltered, but the latter half of the case more than made up for it when things kicked into high gear. Sleuth Kings continues to impress with their original and highly immersive brand of puzzling storytelling! I like the direction the story has taken with this box, and definitely recommend checking it out, especially since it provides such a great payoff and setup for a future storyline. You can use the promo code ESCAPEADVENTURE to get $5 off your subscription here! A Haunted House Worth Getting Trapped In! You’ve foolishly decided to purchase the MacGregor Manor sight unseen. What you didn’t know is this “Dream House” was such a bargain because of the supposed curse that was placed on it decades ago! In fact, no one has been inside since 1974, and the group that entered then was killed in a car accident just one hour after they left. You only have an hour to break the curse and prevent misfortune from falling upon you! 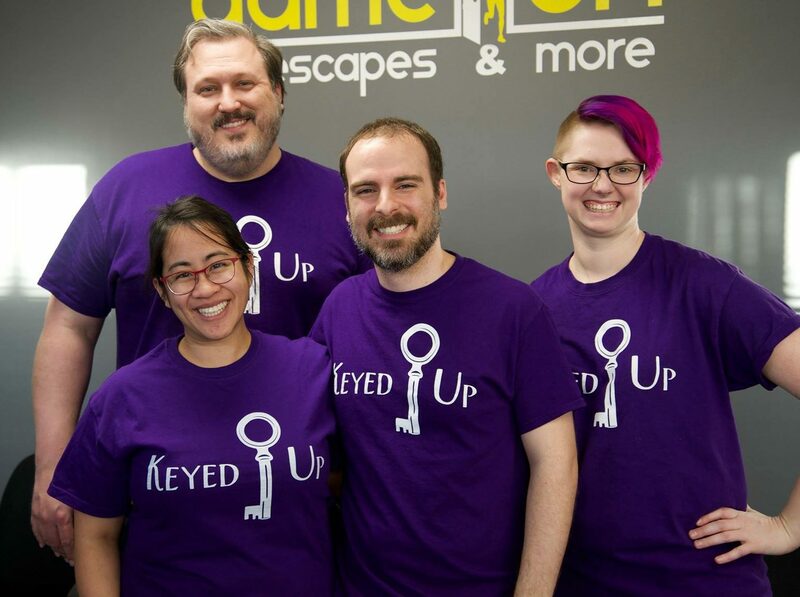 Game On Escapes & More is located in a cozy suite within a large shopping center in Cary, NC, and was well outfitted for having been open for just a few weeks when we visited. The owners were great and very personable, and we found that we had several favorite rooms in common. They were obviously escape room enthusiasts as well, so we were very optimistic to see what they had cooked up for MacGregor Manor! The experience did not disappoint! This room is absolutely chock full of technological interactions that evoke a supernatural feel, all of which have a natural place within the theme of the room. A mix of basic locks are also included, but are placed realistically, preventing any breakage in the immersion. The story is mysterious enough to peak our interest and leads into the room well. Set design is excellently crafted, combining with lighting and sound effectively in order to create a spooky atmosphere without being blatantly scary. Mostly a non-linear experience, this room kept our group of four fully engaged for the most part, allowing us to break apart and come together through the weaving threads of game flow. After a small speed bump at the beginning of the game, the connections were intuitive and full of a ha moments. The room opened up in surprising ways, allowing for the room to hide secrets in unexpected places. There was one point near the beginning where the most obvious puzzle we could engage with was more of a red herring than anything, leading to a good bit of fumbling about before finding what we actually needed to be working on. One puzzle was interesting, but caused part of our group to have actual physical headaches due to the nature of the task itself. There were a couple of spots we felt could benefit from slightly more cluing in order to be less obtuse, as we stumbled upon these solutions rather than find them naturally through the game flow. MacGregor Manor is the first really great escape room in Cary, NC, and I look forward to seeing what Game On Escapes comes up with next! We were able to have a sneak peak at their upcoming Trapped in the Jungle room, and we have very high hopes for the future! You should absolutely check them out here! We landed ourselves a great find, a trove of dragon’s eggs! Like pure idiots, however, we decided to show the king, who has locked them away in a wizard’s tower. We’ve only 60 minutes to take them back before the King’s wizard returns to steal them away forever. Like Project 00, we were given a mumbled story about a Dragon and how we needed to recover dragon eggs we had found that were taken by the king. We told we were wizards, but instead of being able to wield magic during our quest like we did within Quest for Honor, I could see that we were going to be relegated to solving spin dials and directional locks like mere mortals. Entering the room, Dragon’s Keep had a lovely set design, similar to the polish of Mine Shift, evoking the spirit of an ancient castle keep. There were a few technological puzzles that began to evoke the feeling of magic that we were told they were going for, but unfortunately there were also several basic locks to muddle through as well, killing the magical mood. The ideas of the room, like most of Last Second Escape’s experiences, are great, but as can be seen below, the execution is lacking. In a room that we were told was supposed to evoke a sense of magic, there were far too many modern locks, the likes of which you’d find in a high school or in a gym locker room. One puzzle that seemed to rely on correct placement triggered randomly, becoming a room-long joke for our group, and ending by falling completely flat when the tech shorted out, which was, according to an employee, due to pieces falling off of one of the props, which is inexcusable for a new room. Of course, this was noted as “interesting” by said employee, and no apology was offered. Another thing noted as unapologetically “interesting” by this employee was that a certain puzzle within the room had two valid solutions as presented, though only one worked, which caused us extreme frustration. Connective tissue throughout game flow was non-existent, leading to incredible confusion and random solutions. Another puzzle within the room was based on colors, which were difficult to see within the dim room, and adding insult to injury, the light sources given did nothing to help illuminate the parts of the puzzle we needed to see. The design of this game was extremely poorly thought out, presenting a nice looking package, but failing to deliver on all other fronts. Because of these many game issues, we needed to call out for a hint on multiple occasions. The first time we did so, we were greeted with two full minutes of silence, wasting our time until we finally grabbed the attention of the game master. This experience was a disaster on multiple levels. Dragon’s Keep is a beautiful set that is mired in so many basic problems. All facets of our experience were in some way flawed, and we were just happy for it to end. Unfortunate breakdowns in game design and technological interactions leads me to caution against booking this room until it is fixed on multiple levels. If you’d like to check it out anyway, you can do so here. The Saturn Hills Asylum has been shaken by the murder of the Judas Killer, Wolfgang Koch! The circumstances of his murder have police baffled, so the Mayor of Valley Falls has contacted you to help solve the case. This one’s a doozy, though, as most of the suspects are the manipulative and murderous patients at the Asylum! Sift through the evidence and find out what sort of insane plot caused the Judas Killer to be hanged! The sight of another fantastically designed Deadbolt Mystery Society box on my doorstep was a highlight of my day! Opening up this box revealed a much heftier second case from Deadbolt, which is always a great surprise! We enjoyed Deadbolt’s first case Murder in 3B quite a bit, so seeing that there was even more to solve this go round was excellent! Already our favorite subscription box, we were excited to delve into this twisted mystery. Asylum absolutely upped the ante with their second box! Not only does the mystery include more props and evidence to go through, the mystery itself is much more involved, including numerous side stories, online components, and great codebreaking to tackle. Though the side stories aren’t quite as humorous as their previous box, they are engaging and provide realistic clues that immerse you into the world and social dynamics of Saturn Hills Asylum perfectly. We were happy to see that hints and the solution document were separated from the in universe files, which kept us within the world of the Asylum. The puzzles are presented in a believable way, with hidden details pointing you toward each new breakthrough. The props are great, and fit with the theme well, intertwining with the mystery and becoming more integral to the story than in most other subscription boxes. One particular Easter egg was hidden in plain sight and provided us with a particularly interesting moment of realization, occurring just in time to begin unraveling a deeper conspiracy than we had originally suspected. The story is self-contained, and resolves with an excellent climax and explanation, while still hinting that we may not have seen the last of Saturn Hills and its colorful cast of characters. Except Wolfgang. You know, on account of the hanging. Connections could feel a bit more vague during this investigation, and while we correctly determined the killer, it felt like it was due to our full elimination of other suspects rather than solid evidence pointing toward them. Though there are reasons for the suspect to be the killer, we weren’t as 100% sure as we were regarding the Murder in 3B case. Asylum upped the bar for The Deadbolt Mystery Society and subscription boxes overall, further cementing them as the standard all others should be measured by! Crafting an excellent self-contained mystery that left us wanting more, I cannot recommend this box enough! I’m really hoping we get to see more from the cast of crazed characters residing within Saturn Hills in the future, and cannot wait for next month’s box, The Haunting of Indigo House! Join the Deadbolt Mystery Society here! Right now, you can get 30% off your first box with the Promo Code ESCAPE30! You can also see the rest of our Deadbolt Mystery Society reviews here!